When we installed Windows 8 in our office, the first thing we noticed was the absence of the familiar Start button in the lower-left corner of the desktop. Our reaction was like, "Did Microsoft forget something, or what?" After spending the better part of the previous two decades getting used to the Start button and the Start Menu, it felt like a significant part of our body was missing. We tried to get used to the new Start screen interface of Windows 8, then tried again, and finally decided to do something about it and created StartFinity™, the Start Menu software for Windows 8 desktop! 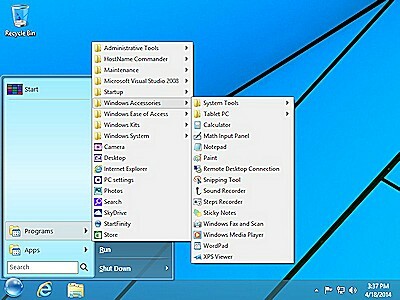 What about Windows 10 or Windows 8.1, don't they come with their own Start menus? 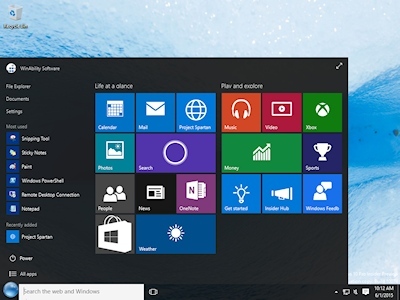 Will I lose the original Windows 10 Start Menu? 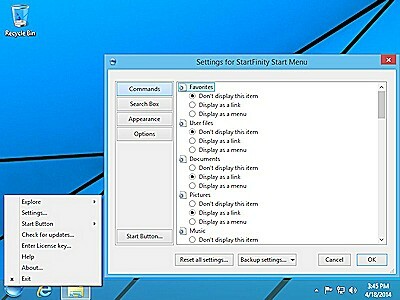 You can also use StartFinity Settings screen to reverse this behavior: you can choose the display the original Windows 10 Start menu when you click on the Start button, and display the StartFinity menu when you press the Shift key while clicking it. The choice is yours! Will I lose the original Windows 8/8.1 Start Screen? 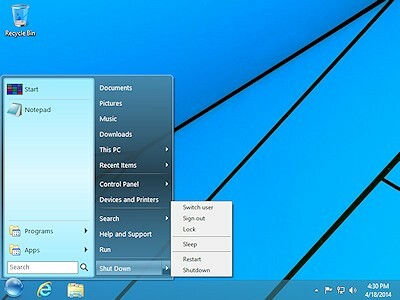 Does the new Start Menu give me quick access to Control Panel ? Does the new Start Menu let me run programs installed on my computer? Can I remove from Start Menu some of the items that I don't use? Does it come with a search box to quickly find programs to launch? Does it show the programs I use frequently? 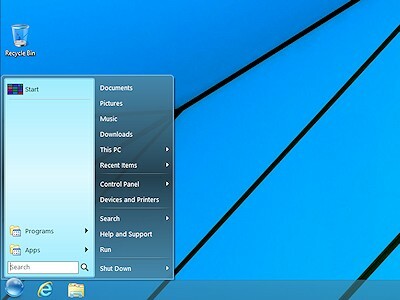 In addition to programs, there is also the Recent Items button on the Start menu that displays the documents you opened recently via the Start Menu. This way, you don't need to spend a lot of time navigating to the documents or programs you use most often. What about the Shut Down button? Does it support languages other than English? Can I change the size of the items on Start Menu? Yes, you can select either small or large size. You can control the size by right-clicking the Start button and choosing Settings from the menu. 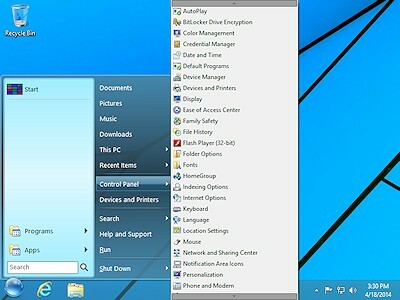 Can I use the Windows key to bring up the Start Menu? Yes, that's another option available: you can choose the Windows key to either activate the Start Menu, or to switch to the Start Screen (as it does by default). The choice is yours! I don't like the blue color, can I get a different button? 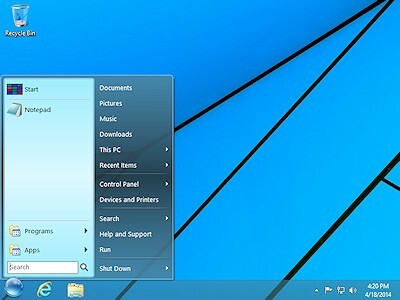 Another option that StartFinity offers is to automatically switch to the desktop mode after you sign in to Windows 8, bypassing the "colored boxes" Start Screen altogether. 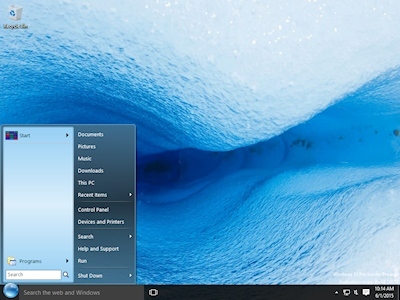 This way, if you really don't like the Windows 8 Start Screen, you will only see it for a couple of seconds at most. Of course, if you change your mind, you can turn this option off any time! 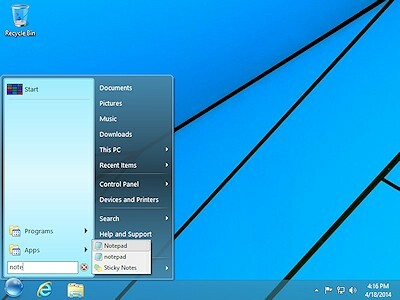 Can I use StartFinity to replace the start menu on my Windows 7, Vista, or XP computer? No, sorry, StartFinity is for Windows 10, 8, or 8.1 only. 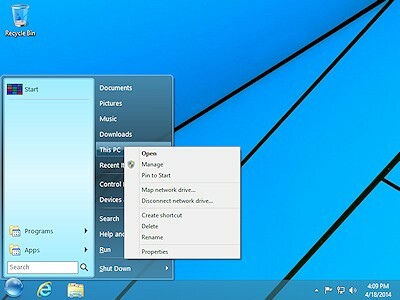 (It can also be used with a Windows Server 2012 in the GUI mode.) It cannot be installed on any earlier version of Windows. Can I use StartFinity on my Windows tablet? If your tablet runs Windows 10, 8, or 8.1, and supports the desktop mode, then yes, you should be able to install and use StartFinity, just like on any other Windows desktop or a laptop. If, however, your tablet does not support the desktop mode, then no, StartFinity won't help, sorry. Can I see the End User License Agreement for this software, please? Definitely: StartFinity End User License Agreement. 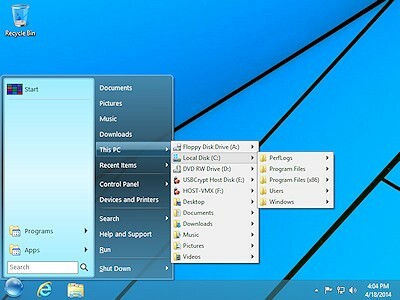 OK, how do I get this software on my Windows 10, 8, or 8.1 computer?